By coincidence my collegue Erwin and I had about the same vacation plans for about the same period: he wanted to go to Croatia at the start of May and I wanted to go to the Dolomites at the end of May. So we decided to combine our targets and go together on holiday. Some vague plans of 'visiting Dolomites and Croatia' turned into an 5,600km trip during which we visited/passed 12 countries. On this first day we wanted to leave the all too well known roads asap behind us, so we took the highway/Autobahn to Kaiserslautern in Germany where the real fun should start. After 450 Km and 4 hours we started to follow the route I'd made through the Black Forest. 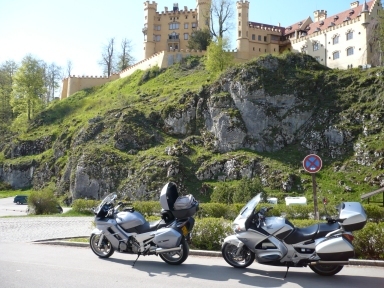 We wanted to go to the Neuschwanstein castle which looked very beautiful on pictures. But since this castle was more than 500km (and 10 hours) away from Kaiserslautern this would mean that we had to do this in 2 days. So we first crossed the Black Forest. A very beautiful region with lots of hills and great for motorcycleing. At around 20.00h we had enough of it and searched an hotel which we soon found. Target of today was Italy, but we didn't quite make it. 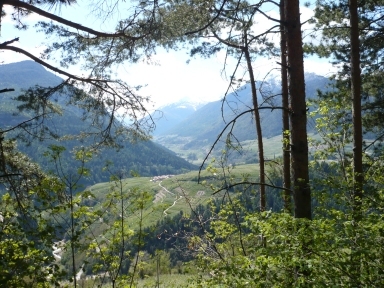 First we went from the south of the Black Forest to the southern border of the Boden Lake. Nice surroundings, but getting through all the small villages on the shore took a long time. During the trip we crossed several times the borders between Germany, Switzerland and Austria. At around 15.30h we were at Neuschwanstein. You could visit the castles only by bus and we had no intention to do so. So, we made some pictures and headed for Austria and Italy. 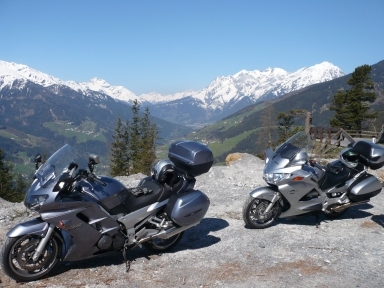 We wanted to take the Timmelsjoch pass to Italy but only far up the Oetz valley we heard that the pass was closed due to snow. Well, actually I had seen the signs stating this already several km's back. I thought Erwin had seem them too (they were quite hard to miss) and knew another route, but he did manage to miss them. So we ended up that evening in the Austrian village Laengenfeld where we found a nice (and cheap) lodging. When we left Laengenfeld the temp was no more than 3 degrees Celcius. Chilly. We had a great trip through mountains and saw our first snow at the verge of the roads above 1,500m. At 10.30h we passed the Austrian-Italian border. Actually, thanks to the Schengen Agreement you can hardly speak of borders in Europe anymore. 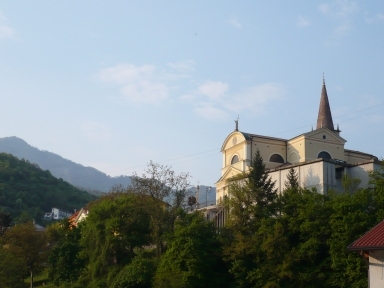 Around 15.30h we were in Bolzano, at which time temps had risen to 27 degrees Celcius. 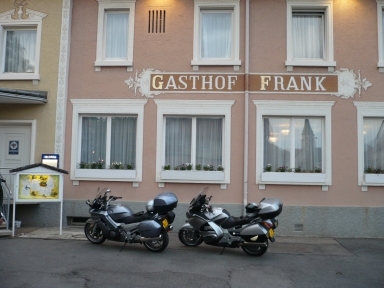 In Laives, a place near Bolzano, we found a place to stay in a bikers hotel (Hotel Steinmannwald). From the, motorcycle driving, owner we got some motorcycle routes that started at the hotel. We decided to stay for two days there to do the route around the Garda Lake and to drive through the Dolomites ourselves. During this day we passed several passes who were lying at heights of up to 2,200 mtr. Above 2,000 mtr there still was a lot of snow next to the roads, but the roads themselves were very clean. Some passes consisted of about 30 hairpins and it was a lot of work to get our big bikes through them. But it was a lot of fun. 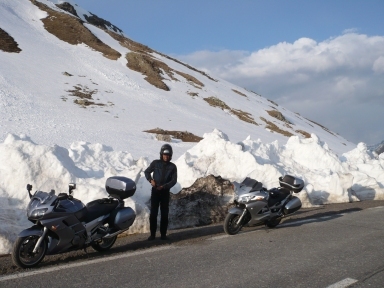 The temperature difference between the top of a pass and the valley was on average 10 degrees Celcius. Today we left for what seemed to be a nice trip around the Garda Lake. It became a trip of almost 12 hours. En route we had diner with -of course- a real Italian pizza. For the last part we took the highway and let the bikes stretch their legs. It's very special to ride fast on an unknown highway in an unknown country. Around 22.00 hour we were back at our hotel. Tired and happy. After the previous tiring day we wanted to take it rather easy this day. Of course it turned out to be quite the opposite. First we took another Dolomite pass, this time one of about 1,900 mtr high. Next we went over curvy roads to Venice. Since we were more or less in the neighbourhood we wanted to visit this famous city too. Venice was quite crowded and we couldn't find a decent spot to park out bikes without getting a ticket. There was a place in a parking garage for 15 euro per bike, but we found that too expensive. So we turned back. Halfway on the bridge connecting Venice with the mainland I had second thoughts. If we had to return another time it would cost at least that amount of money and probably more. Erwin had the same deliberations, so we turned back again and put the bikes in the garage. 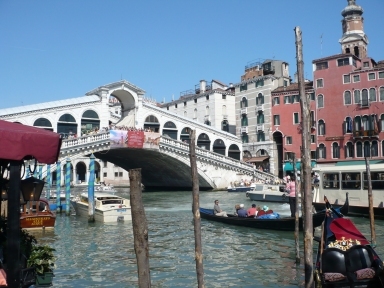 Venice is beautiful, and a must see, but I think once is enough. Pretty soon we were on the bikes again and heading to Slovenia. The road between Venice and Trieste (near the Slovenian border) is straight and very, very boring. It was already dark when we at last crossed the Italian and Slovenian border and we couldn't see a thing of this, for us, new country. I always thought Slovenia was a rather poor country, but the first thing happening to us was a Ferrari passing us at topspeed ;). The stretch of Slovenian land between Italy and Croatia is quite small, so we soon left the country again and were at our final destination. Finding a hotel wasn't a big problem since the part of Croatia we were now (Istria) is very tourist minded and has lots of nice hotels. We found one in Umag, near the coast: Hotel Kristal. Time to discover Croatia. 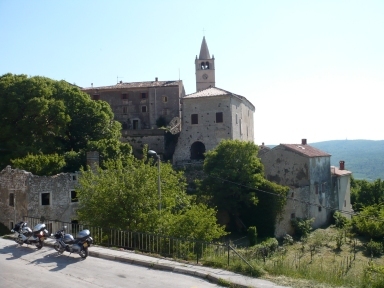 First we had a look at Istria: hilly, very green with lots of trees and bushes and not that interesting for a motorcyclist. The coastal towns were nice though. Next we followed the coast road in search of yet another hotel. During this stretch we were stopped by the Croatian police who checked our paperwork. Of course everything was fine. We followed our way through the terrible city Rijeka with its shipyards and petroleum industry. Outside the town we were hold up by a slow driving car and when we had a chance we passed it at high speed. Thereby totally surprising another Croatian copper who was manning a speedtrap with his lasergun. We left him flabbergasted behind us. At the island Krk (connected to the mainland with a -toll- bridge) we found a great hotel in Njivice: Hotel Miramare. Since we were in a comfortable hotel at a nice place we thought it would be a good change to have a day of rest. In our case this meant that we 'only' did 160km on the bikes that day, driving around Krk and have a look at the nice villages along the coast. 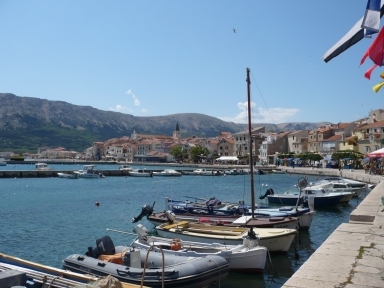 Today we wanted to leave the touristic coast of Croatia behind us and experience the 'real' Croatie, more inland. We left Krk and headed East. We passed some mountain villages and although the surroundings still looked very nice it was clear that we had left the touristic areas behind us. 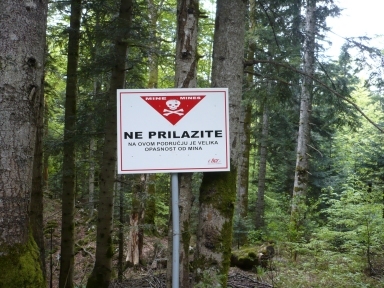 When we crossed a National Park we were warned for minefields by signs. Not something to attract tourists ;). 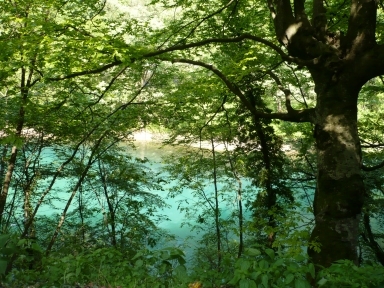 Near the Bosnian place Bihac we crossed the Croation-Bosnian border. Because our GPS navigation stuff didn't have maps of Bosnia I rode in front with a map. We followed a road along a stream and it all looked quite attractive. Until we came in a place were we saw for the first time the remnants of the war more than 10 years ago: a minaret showed signs of shelling. Halfway our small trip through Bosnia the characters on the roadsigns changed form Western to Cyrillic and I had no clue were to go anymore. Happily Erwin had studied Russian so we could make it to the Bosnian-Croatian border. The Northern border region of Croatia and Bosnia had signs of intense fighting: a lot of houses were covered in bulletholes and some houses and factories had been burned and abandoned. This day ended in a hotel in Daruvar after a longish search for hotels, since we were -as planned- no longer in a touristic region. We wanted to be back home at Friday, so now it was about time to head North-West again. This time we could see Slovenia at daylight. The Slovenian country side doesn't differ much with the Croatian one. In little time we crossed Slovenia and were back in Austria again. The roads here were remarkably better, allowing us to cover more km's in the same time. At the beginning of the evening we were in Italy and found a hotel in Tarvisio (Hotel Nevada), not far from the Dolomites. 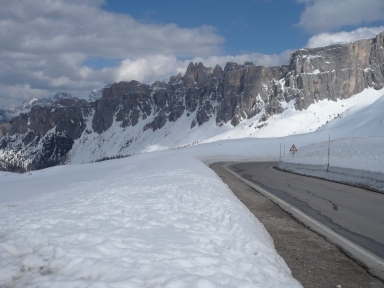 Back in the Dolomites we of course had to drive over some more passes. It just stays big fun. Around 17.00h we left Italy and were sure we would come back asap. In the fading light and with rain showers not far from us we crossed in Switzerland our highest pass of this vacation: 2,389 mtr. With temperatures of around 6 degrees the grip heating again did a great job. Because we were in the neighbourhood and to add one more country to our list we visited Liechtenstein as well. Not much to do overthere, but it was funny to see cars with license plates you hardly ever see anywhere else, because there aren't that many of them ;). From Switzerland you can freely cross the border with Liechtenstein, from Liechtenstein to Austria you have to show your papers to the Customs (if they ask for it). Because we didn't want to change money we didn't want to stay in Switzerland and we headed for Austria where we stayed at Hotel Post in Feldkirch. The last real vacation day, because on Friday we'll probably have to drive home over highways in order to get back home at a decent time. From Feldkirch, Austria we went to the North of the Boden Lake in Germany. Hoping to find some nice roads but there weren't any. Well, the roads were kinda ok, but the busy traffic hindered us in our journey. I started to fear for the rest of the day, but happily when we approached the Black Forest traffic got less dense and the roads were nice again. In fact we were doing so well that we could move our target of that day a but further. 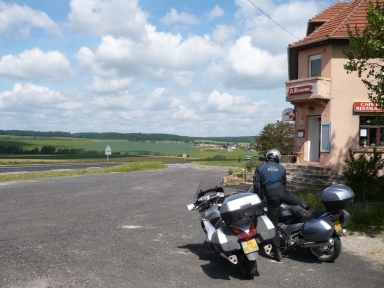 We were heading for Le Bonhomme in France because it seemed to be on a crossroad of some nice curvy roads, but we made it to Schirmeck, 55km more to the North. Here in the Vosges we found Hotel Neuhauser, a so called silencehotel. And quiet it was, until men with chainsaws started to work in the morning ;). In the evening Erwin beat me with Scrabble, I'm still waiting for a rematch. Alas, the last day of the vacation. 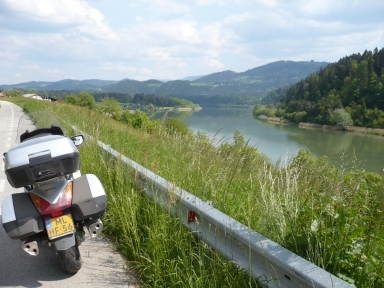 First we took some nice curvy roads in the Vosges, then, at the end of the morning, we headed for the highways. From France and Germany we went to Luxembourg and Belgium in order to add the last two countries to our list. The shortest route home would have been through Germany, bypassing Belgium and Luxembourg. On the highways we could maintain a nice speed (until the traffic jams in -of course- The Netherlands) and at around 17.00h we were home again. During this trip of more than 5,600km Erwin and I passed 12 countries: The Netherlands, Germany, Switzerland, Austria, Italy, Slovenia, Croatia, Bosnia, Liechtenstein, France, Luxembourg and Belgium. The weather was perfect, the people were friendly, the surroundings were great, the roads were mostly good. 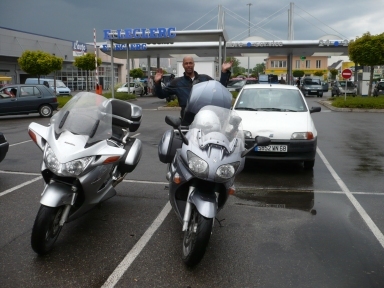 The bikes gave absolutely no problems (except for the two broken bulbs of the Yamaha) and were perfect for the task of crossing Europe. This has been the best vacation for me ever. Go here for all the pics of this trip!